$50 Certificate To Ed Barbo’s Columbia Clothing Co. 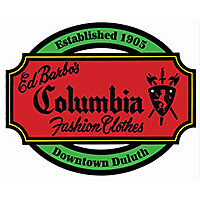 Win a $50 gift certificate to Ed Barbo’s Columbia Clothing Co. in Downtown Duluth, courtesy of the Greater Downtown Council. Ed Barbo’s Columbia Clothing Co.